Given the mercilessly early hour of our departure Friday morning, I planned to do little else but sleep, sleep, sleep. For the first few hours of travel, it was as if our entire bus had been bewitched into silent slumber. But things changed once we passed Salerno and moved farther than I’d ever been on the Italian peninsula. The views became so stunning that I couldn’t close my eyes. A constantly shifting panorama unspooled outside the window. In one moment I was staring at rocky canyons encrusted with scraggly trees, and in the next–desertscapes arrayed with pale cacti, sloping hills blanketed by yellow flowers, and snow edged mountains. 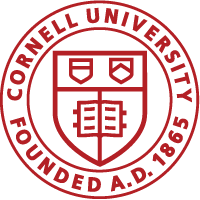 Each time the bus entered the vortex of a tunnel, we emerged in new world-and each new world was more legendary than the last. Deep gorges surged up into jagged peaks and cliffs, which towered above the bus like inverted stalagmite caves. What really struck me about these vistas was the near absence of man-made structures. 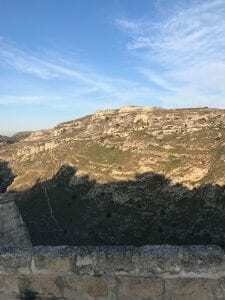 In the absence of buildings and humans, my gaze fell upon flurries of shiny brown deer, fleets of beautiful goats with long curved horns, and cloud-like clusters of beige sheep. If this is what is signified by the “undeveloped” South, the “backward” South, I thought, I’ll never go North again. Such an endless reel of natural glory had not been visible from the windows of our Milan-bound train. 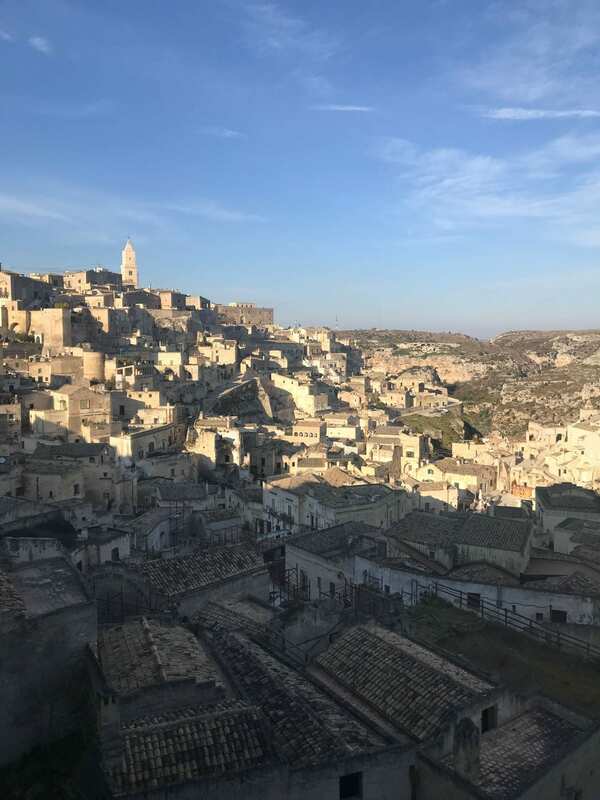 As we progressed from Caserta to Salerno to Potenza, the final destination was Matera-a city of carved out of rock canyon in prehistoric times, and named the European Capital of Culture in the year 2019. I think I speak for all of us when I say I loved it. 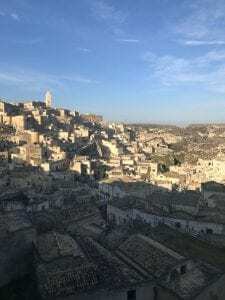 For me, the magic of Matera was the way it seemed to capture the rugged natural formations of the South, the topographies I’d been admiring all morning, and meld them into the shape of a city. 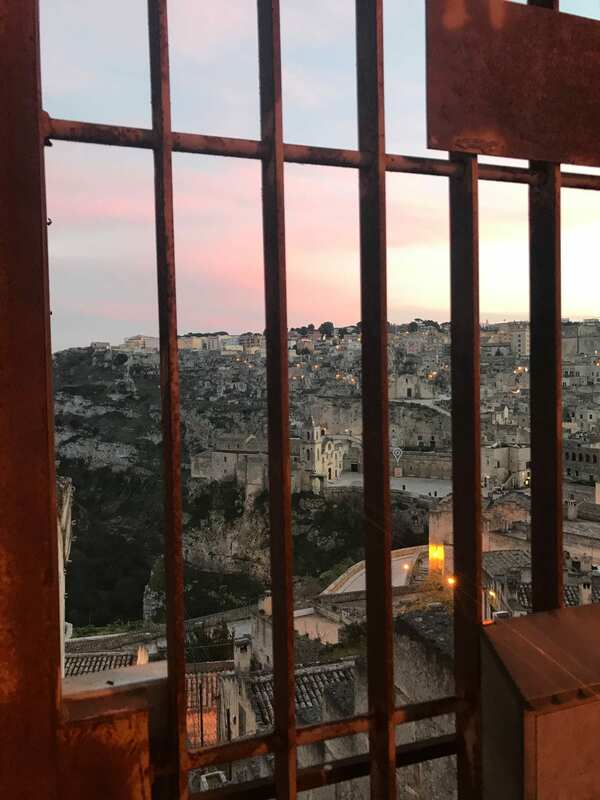 From every vantage point in the historic center of Matera, the city and the landscape it was built from seem to collapse into each other. 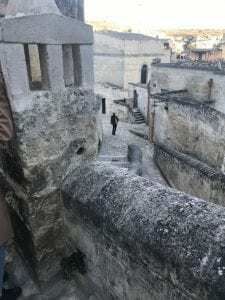 Matera’s city center is tellingly named “I Sassi”, or “The Stones”, and divided into two “stone” neighborhoods, “il Sasso Caveoso” and “il Sasso Barisano.” Our incredible 4 hour tour of this area with local scholar Antonio Manicone felt like a lesson not only in architecture and urban planning, but in anthropology, art history, archeology, geology and even paleontology. 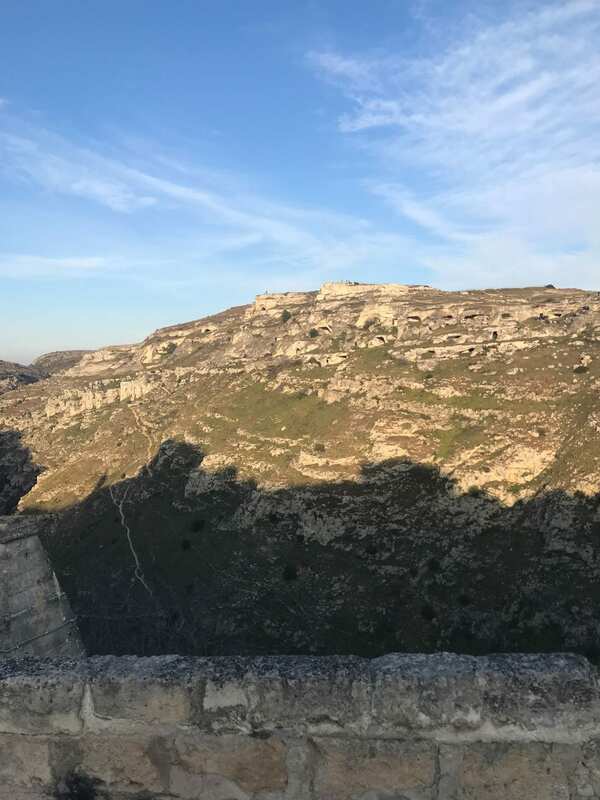 Antonio could pull every drop of symbolism from a Romanesque church facade, unfurl the centuries of history belonging to one of Matera’s rupestrian churches and then show us pieces of shells in a stone wall to identify it as limestone rather than volcanic tuff. 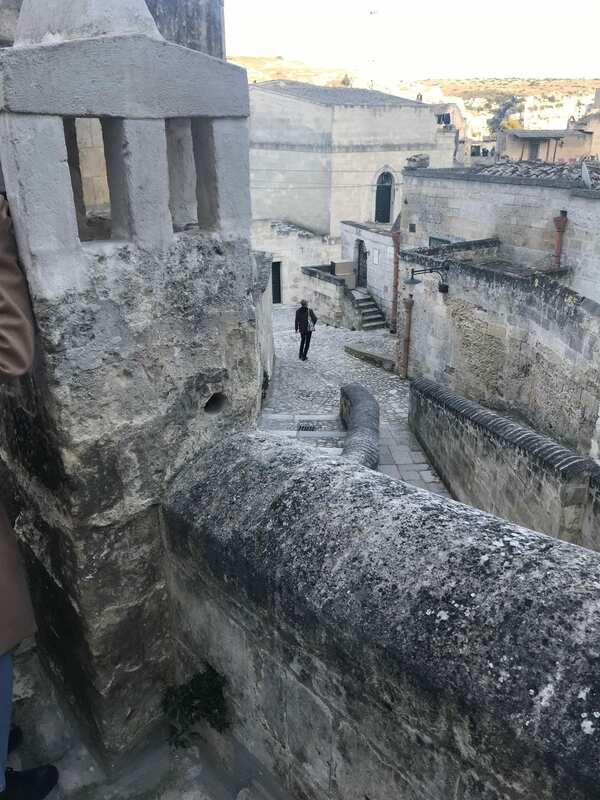 Our afternoon in Matera was thus, in a word, stupifying. 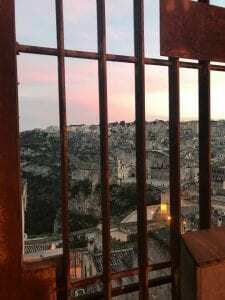 When evening fell, we dined in cave restaurants, and that night many of us slept in cave rooms. But by 7:30 the next morning, our luggage was already rolling over the stones. 8 am struck-and we were off to Pompeii.